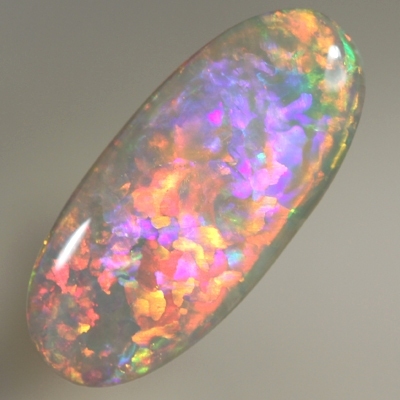 Neon red, orange, pink and magenta move across the opal with 5 out of 5 brightness. A touch of yellow, green and a beautiful mauve purple show through at times. The colour patches are shaped like jig-saw pieces. Each interlocking with each other. The colours are all neon bright with the jigsaw pieces coming together to make a broad rolling flash that moves back and forth over the opal. The fire show is constantly changing, moving over the opal as you rotate the opal. Great in all lights.